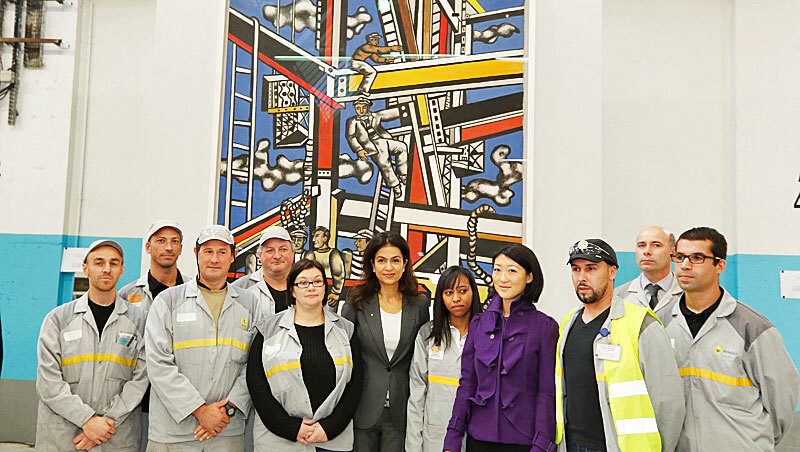 From November 3 to 7, 2014, the Fernand Leger national museum will feature one of its masterpieces at the Renault Flins plant: Les Constructeurs, definitive version by Fernand Leger (1881-1955). The Renault factory employees will get to enjoy this painting thanks to the L’Entreprise à l’oeuvre project, organized by the French Culture and Communication Ministry, in cooperation with 5 French companies. L’Entreprise à l’oeuvre project organizes exhibitions of works from public collections on business premises. Up to ten works will be included, for a period of one week on each site. This first exceptional exhibition, organized at the heart of a working industrial site, the Renault Flins factory, was opened by Fleur Pellerin, French Minister of Culture and Communication and Mouna Sepehri, Executive Vice-President, Office of the CEO, and member of the Renault group Executive Committee. In the same way as a production worker, the artist worked on the theme of builders: “When I built Les Constructeurs, I did not make any artificial concessions. I got the idea driving to Chevreuse every evening. That’s what I wanted to convey: the contrast between man and his inventions, between the worker and all this metal architecture, the iron, the scrap, the bolts and rivets. I used a technical approach to position the clouds but they provide a contrast….” Les Constructeurs (definitive version) is the main and most accomplished work in a series of around a dozen works and several studies. Playing on colour and false perspective, Léger paints a scene marked out by girders soaring to infinity. Two moving objects add life to the composition: the rope in the forefront and the clouds at the back. Like acrobats, the builders defy the laws of balance. Léger was keen to see what ordinary workers thought of his work and took it to the Renault site in Billancourt.